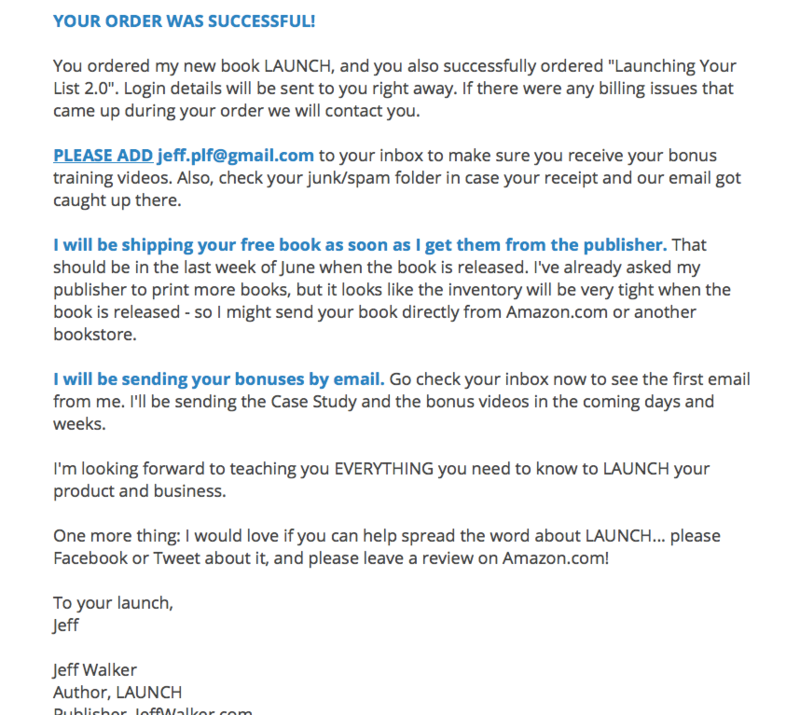 Jeff Walker is known as the godfather of online product launches. 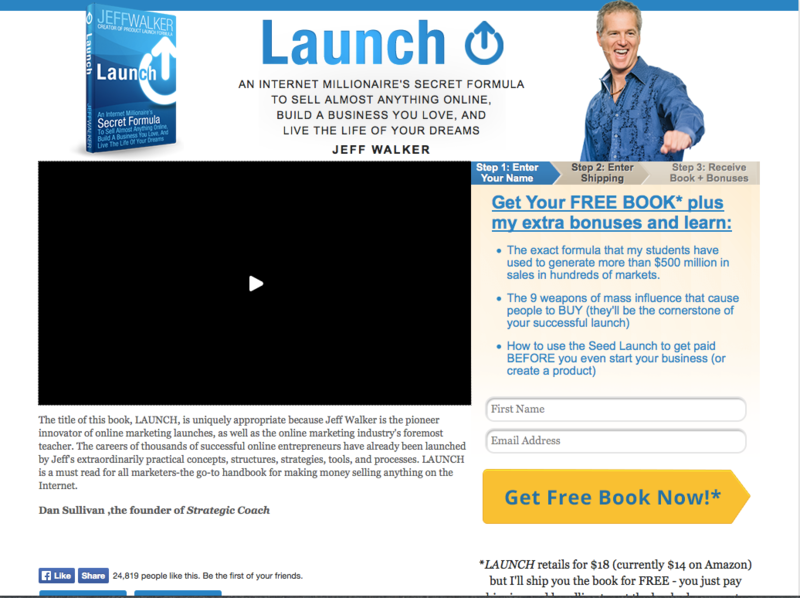 He is famous for his Product Launch Formula – a blueprint detailing the exact steps necessary to launch products online. If you carefully watch what he is doing you’ll likely discover how to launch a book online. I believe there is a lot to be learned from watching and carefully examining not only what Jeff does, but how and why he does it. Jeff didn’t make his journey to prominence by accident; it was carefully planned and diligently pursued. Without question, Jeff is a master at both marketing and skillful self-promotion. His recent book giveaway campaign is a great example – and certainly worth studying – particularly if you want to know how to launch a book online. A hook is language, an image, video, or some other method used to draw people to the next step in the process. Subject line – “Here’s my new book…for free”. What a great use of curiosity. 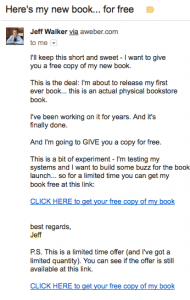 We all know that nothing is free…and yet Jeff wants to give me his new book for free. This subject line is a great hook! The subject line makes you want to open the email and see what the catch is; after all, nothing is free. 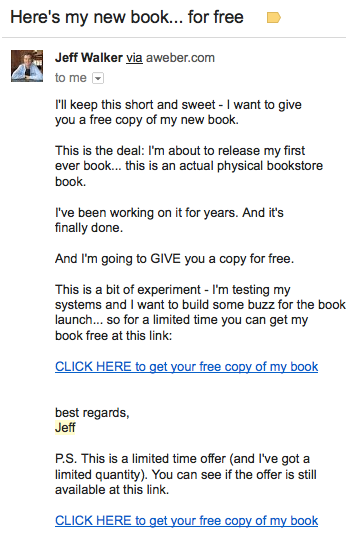 “…I want to give you a free copy of my new book.” Here he’s simply validating that he really does intend to give you his book for free. Notice how he uses those last two sentences to build value in the minds of his readers. “…an actual physical book” indicates this isn’t some ebook that he threw together. “I’ve been working on it for years.” This sentence informs his readers that this must be really good, because why else would anyone spend years working on something? “This is a bit of an experiment…” Oh good, he’s finally going to reveal the catch. “I’m testing my systems and want to build some buzz for the book launch…so for a limited time you can get my book free at this link:” Hmmm…still no explanation other than “testing my systems” and “build some buzz for the book launch.” If you want to know the truth you’ll have to visit his link. The famous P.S. – “This is a limited time offer (and I’ve got a limited quantity). You can see if the offer is still available at this link.” Notice the use of scarcity. If you want your free copy, you better click the link now before all the copies are gone. For the sake of time I’m not going to dive into all the marketing tactics used in the video found on this page. Instead, I’m going to focus on the written content on the page. However, the video is worth studying. Social Proof and Validation – take a look at the small text across the top and the bold headline below. You’ll notice that this information reinforces that both the book and Jeff are trustworthy and that the content must be good. The Video – he does a great job of providing high-quality content. He also does an excellent job of selling you on why you need the secrets he reveals in the book. Testimonials – under the video is a small testimonial section that includes book endorsements from some very recognizable names. The site slower rotates through several of these. 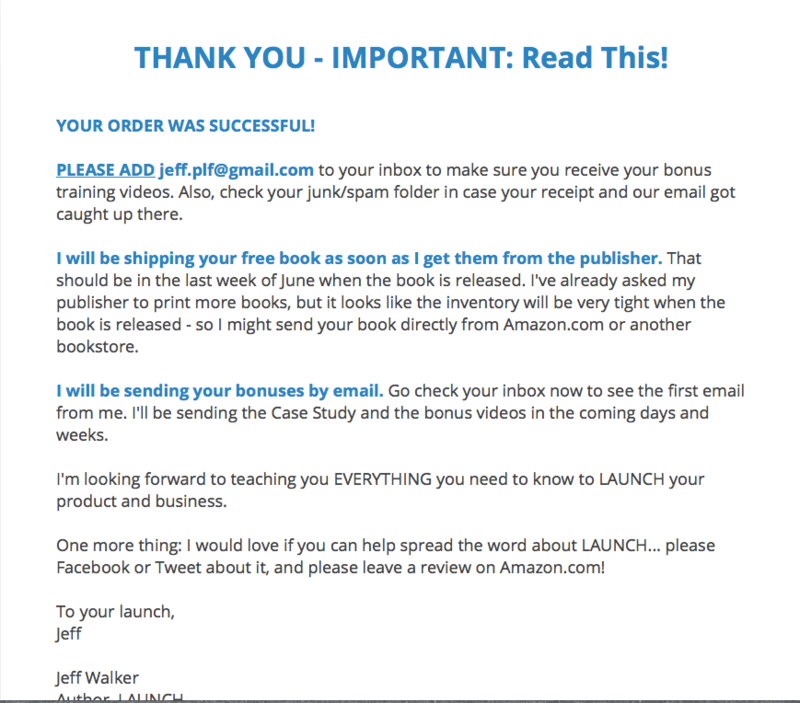 Three Simple Steps – Jeff does a great job of showing that there are only 3 simple steps to getting your free book. Step 2 – Enter Your Shipping – Notice he didn’t say, “enter your payment information,” which is required. Again, he doesn’t want to scare people off. 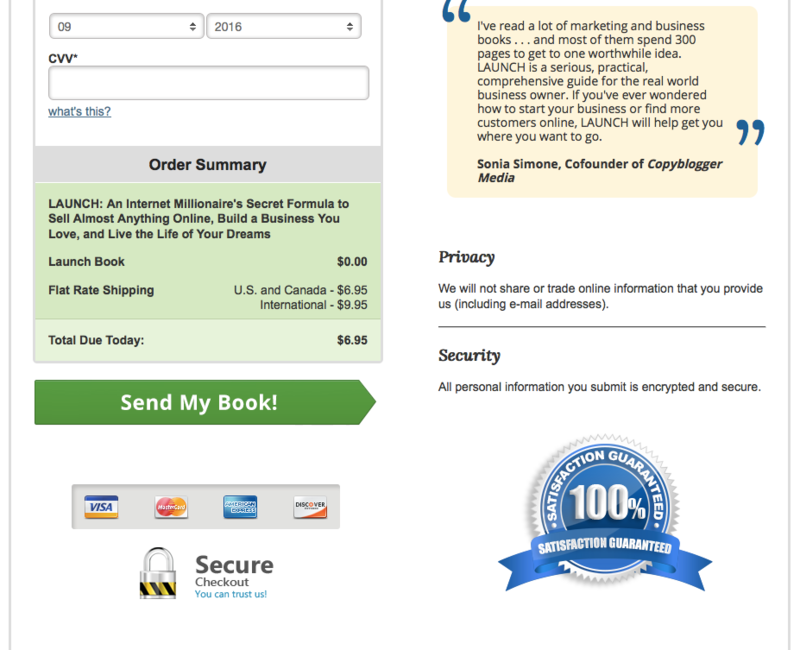 Step 3 – Receive Book + Bonuses– Oh, what’s that? Bonuses? That’s cool. Get Your Free* Book and These Gifts – Notice the word “your.” You see, the book is yours; you just have to claim your copy. And if that wasn’t good enough, Jeff also wants to give you some extra bonuses! It’s also worth noting that it is in this headline that the * is introduced, indicating that maybe the book really isn’t completely free. What Does the * Mean? – Again, the way Jeff explains that the book really isn’t free is superb copywriting. *Launch retails $18 (currently $14 on Amazon) but I’ll ship you the book for FREE – you just pay shipping and handling to get the book plus my extra bonuses. Notice how he begins by providing a point of reference, a context, so that you will understand the value of what you are receiving. The book retails for $18 – when’s the last time you paid retail for a book? Rarely! But he uses the retail price to build perceived value. The Optin – Although he didn’t mention it above, he is now asking for your email address. The top right of this page contains what I would call reinforcement copy. This copy is designed to reinforce that you’re making a good decision, and that you should proceed. It’s also worth noting that Jeff provides a phone number and customer support email. Although I doubt many people had any issues with the order page, adding these elements helps put people at ease that Jeff and his company are legitimate. The bottom right of this page contains testimonials to remind you that Jeff and his content are trustworthy. It’s also worth noting that Jeff includes what I call the peace of mind badges – like the credit card icons, the Secure Checkout icon, and the 100% satisfaction Guaranteed badge. Although anyone can use these badges on their website, they lend a little extra credibility. When the page loads, the video automatically starts playing. This prevents people from skipping the video. Please watch this video for next steps – this headline indicates that you need to watch the video to complete your order. When the page initially loads there is no button you can click. The video does an excellent job of selling you on a highly discounted offer from Jeff. After the video has been playing for about 30 seconds, only then do the navigation buttons appear. Once the buttons appear, you only have two options: take advantage of his generous offer, or to pass it by. All too often entrepreneurs have a prospect with money in hand, and then they give the prospect too much time to decide. And nine times out of ten, the prospect will choose to not take again. Notice that the product doesn’t get added into your cart. You’re not redirected to another page with more details about the product…if you click the button you’ve purchased the upsell. This doesn’t give people time to change their minds. Sure, this likely results in a higher refund rate than if they added another step in between, but I’m confident that Jeff makes far more money using the setup he currently has in place. Even though I just rejected Jeff’s generous offer of his product for 80% off the retail price, he doesn’t make me feel bad. 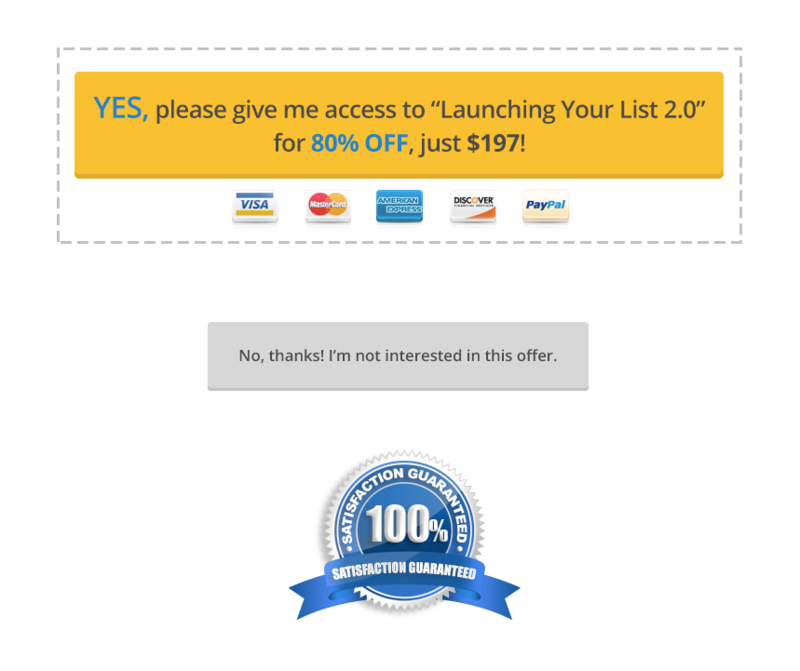 All too often internet marketers push visitors too hard if they don’t accept their upsell offer. You may have been through an order where if you rejected the initial upsell they would next try a downsell. Although there’s nothing wrong with this approach, I personally feel like I’m being hounded when I’m continually sold to. Particularly, immediately after I said no to one of your offers. Take a look over the copy above, and you’ll see that Jeff doesn’t make the reader feel bad for rejecting his upsell offer. He tells you exactly what to expect next…and when to expect it. Most marketers would fail to ask for this favor for their readers, and that is a big mistake. Remember the law of reciprocity! It’s in his favor here, particularly since he just “gave” you a copy of his book. As with any of the top marketers, I would encourage you to not only watch what they do…but more importantly explore why they are doing it. 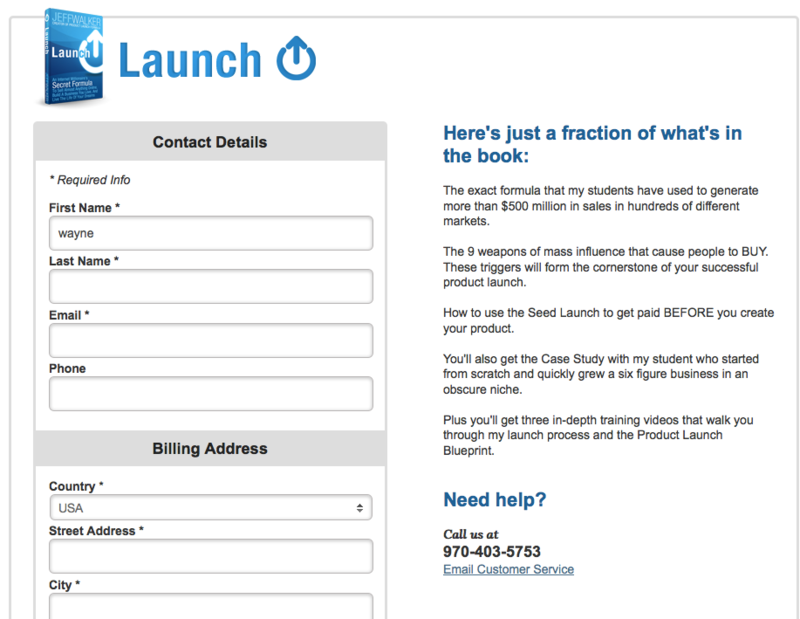 Study how to launch a book online by watching what market leaders do. In Jeff’s case, he will undoubtedly make money on this promo through his upsell, but he will also build his list and help pre-sell copies of his book. Sure, Jeff’s taking a risk and losing money on each copy he “gives away”, but it’s a very calculated risk with very little potential downside. Do you have a product or service that you could position as a loss leader? What product or service do you have that could be used as an upsell? Feel free to steal these lessons and use them when crafting your offer. Oh, and if you think about, I would love to hear about the offer you put together…leave a comment below.